Cloud Computing is a technology that uses the internet and central remote servers to maintain data and applications. 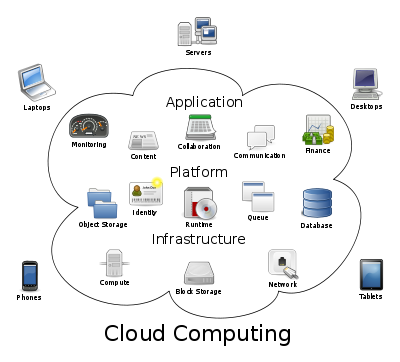 Cloud computing allows consumers and businesses to use applications without installation and access their personal files at any computer with internet access. This technology allows for much more efficient computing by centralizing data storage and processing .The name cloud computing was inspired by the cloud symbol that's often used to represent the Internet in flowcharts and diagrams. A simple example of cloud computing is Yahoo email, Gmail, or Hotmail etc. All you need is just an internet connection and you can start sending emails. The server and email management software is all on the cloud ( internet) and is totally managed by the cloud service provider Yahoo , Google etc. The consumer gets to use the software alone and enjoy the benefits. The analogy is , 'If you need milk , would you buy a cow ?' All the users or consumers need is to get the benefits of using the software or hardware of the computer like sending emails etc. Just to get this benefit (milk) why should a consumer buy a (cow) software /hardware ? The services are broadly divided into three categories: Infrastructure-as-a-Service (IaaS), Platform-as-a-Service (PaaS) and Software-as-a-Service (SaaS). Infrastructure-as-a-Service like Amazon Web Services provides virtual server instance API) to start, stop, access and configure their virtual servers and storage. In the enterprise, cloud computing allows a company to pay for only as much capacity as is needed, and bring more online as soon as required. Because this pay-for-what-you-use model resembles the way electricity, fuel and water are consumed, it's sometimes referred to as utility computing. Platform-as-a-service in the cloud is defined as a set of software and product development tools hosted on the provider's infrastructure. Developers create applications on the provider's platform over the Internet. PaaS providers may use APIs, website portals or gateway software installed on the customer's computer. Force.com, (an outgrowth of Salesforce.com) and GoogleApps are examples of PaaS. Cloud computing means having every piece of information you need for all aspect of the life at your fingertips and ready for use. servers. The information you have shared regarding this is really nice.